South view on the left has plenty of glass. West view on the right has much less glass. This couple wanted their home to be sustainable because they believe it is morally right, whether it reduces energy costs or not. They made it very clear that their home must use less energy and water, and use materials that cause less harm to our planet. 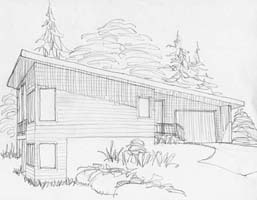 We started with a much larger design, but the economy forced us to reduce the size of this home. It was very important to have noise separation between the television area and the rest of the home. 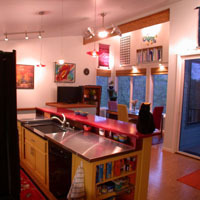 I could also tell that this couple wanted their home to be modern and unconventional. But it was made very clear to me that there was one more factor more important than all of these others. They live in their home by permission of their cats, and this home must be designed for their furry children. I started with the site, which thankfully faces south. 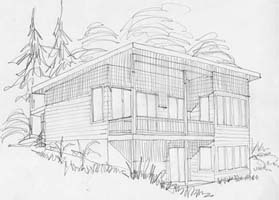 I measured the slope and designed the home to have the doors on both levels close to grade. To provide the modern design they wanted for less cost, I designed a simple low pitch roof. I faced the majority of the glass south, and sized the roof overhang to optimize solar gain when it is cold outside. Together with a good insulation design, and air tight construction, the heating and air conditioning load was drasticly reduced. To reduce water consumption I specified a water tank buried below the roof to store rainwater for gardening. The local government does not allow us to use dual water systems yet. 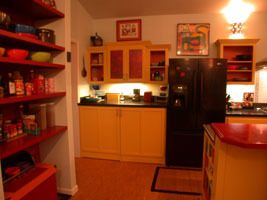 I also worked on reducing size to keep the home within budget. We found a contractor who was genuinely interested in these sustainable features, and the clients hired me to perform inspection services during construction. The left photo shows the north and west sides. 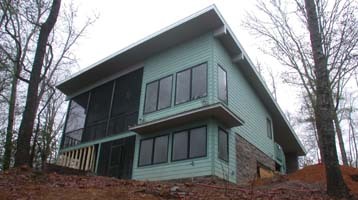 The reduced glass keeps the home more comfortable from the hot westerly sun, and the cold northerly wind. The hill goes up against the concrete wall on the north side to further reduce energy costs. Even the roof line helps by directing the cold winter winds right over the house. The right photo shows the north and east sides. Small awning windows provide much more resistance to cold northerly winds. 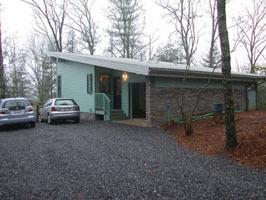 These photos show the south view. The overhang on both levels keeps the hot summer sun out. But in the winter, plenty of warm sunshine heats up the glass, and their home. 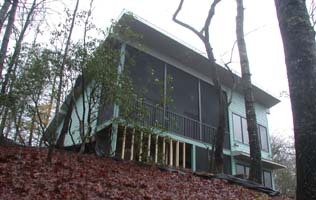 Even the screened balcony is kept comfortable in the winter by the southerly sun and the protection form the north wind. 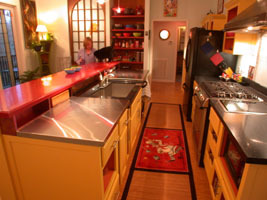 The kitchen is the real center of this home. It was designed to show off their colorful artwork, yet serve their practical needs. The pantry is nothing more than open shelves to display their food. 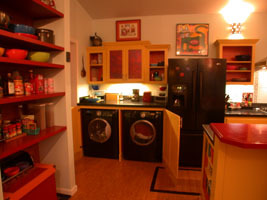 The laundry area is in the kitchen behind cabinet doors, a practical solution that saved a lot of space. The dining area faces the southerly view. Multi-color chairs add interest. 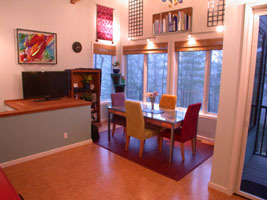 The cork floors provide a nice backdrop to direct attention to the bright colors. 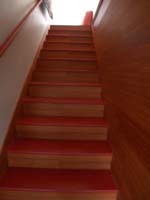 The wall beside the stairway is covered with bamboo finished with hand rubbed tung oil. These clients were a joy to work with. I especially appreciated their imagination and open minds.